A study in (Bird) Houses! Everyone needs a roof over their head. It's nice if it has a good foundation to keep things dry. Curb appeal makes a difference when you're in the market for a new place. Personally, I love the architectural features that come with an older home. A secluded location is something to consider. A little extra space for the kids to play, bonus! We had a family celebration recently and one of the appetizers we served was this festive pizza spread. Very easy to prepare and very tasty to serve, you might want to consider this for your next gathering. Evenly spread cream cheese on a pizza pan. Combine catsup, horseradish, and shrimp. Spread over cream cheese. Cover with plastic wrap and chill overnight. Sprinkle shredded cheese over tomato mixture. Top the "pizza" with green pepper, tomatoes, green onions, and olives. Serve with Tostitos. and enjoy the beauty of the day! We recently enjoyed an Evening Tea at Willow Oak Herb Farm in Severn, MD. Tables and chairs were set up throughout the 40 acres farm, tucked in among the many theme gardens and out buildings scattered about the grounds. We enjoyed seating in the little cabin, built by the owners husband. We began our evening tea with a nice slice of warm quiche. Quite flavorful and tasty, it was a prelude of what would be a nice variety of tea party treats. Here, owner Maria Price-Nowakowski is offering the assortment of miniature tea sandwiches. Sweet little nosegays of herbs and flowers from the garden were presented to each guest. Such a colorful and fragrant basket full of pretties! Cinnamon Chips scones with clotted cream and jelly was the next course served in a large wooden bowl. Beautiful platters laden with miniature cheesecake and cookies were waiting to be shared with the garden guests. A tasty little end to a memorable evening. Please Note: We are joining Bernideen's Tea Time Blog and linking to her Tea in The Garden series. Such a fun variety of fairy vignettes tucked amongst the gardens and landscaping at Willow Oak Flower & Herb Farm. It was fun to discover each little secret treasure! Are there fairies flittering about in your garden? A cozy little cabin porch, nestled in the back forty, was the recent setting for an evening tea party at the end of a day of traipsing thru gardens. Willow Oak Flower and Herb Farm in Severn, MD was our destination. Their "High Tea" is prepared by the Elkridge Furnac Inn and is served in the garden cabin or gazebo by the pond. The pretty little garden settings in the previous posts were all set up for our bus group of 54 attendees. It was a pleasant evening, and a delight to wander the herb farm discovering the little tea party vignettes scattered about the 40 acre farm. Owner Maria Price-Nowakowski tends 20 theme gardens including a silver garden, culinary, fragrance, fairy garden and more. Wouldn't it be fun to visit a garden tea room? Perhaps the tables would look like this. Tucked around the garden, set with colorful flowers and herbal designed tablecloths. A mismatch of teacups with various garden flower patterns. Such fun it would be! Do you have a favorite place where you take tea? Such a tranquil little spot, tucked amongst the garden greenery. Time for tea! Bernideen in Colorado always shares fabulous tea time in the garden posts on Tuesdays. We're joining her today and sharing a fun afternoon garden setting we enjoyed while on a special bus trip yesterday. Stroll past the Silver Garden, and you'll come to a lovely enclosed porch with a welcoming arrangement of colorful flowers on the door. Once inside, please sit down, and join us for a lovely afternoon of tea and chatter. Like the common name suggests this plant smells of skunk! Huge leaves, it is found in shaded, swampy areas. A hardy perennial this is one of the plants that has survived the ice age. The roots are quite large and round and are said to help with ring worm. It is edible -- but you have to get by the skunk smell and the tingling sensation it leaves in your mouth. I would say it is edible but only if we are in an ice age. Symplocarpus foetidus, this is the Eastern Skunk Cabbage but it is very closely related to the Western skunk cabbage. The flowers come up very early in the spring. Sharing sweet remembrances of tea times spent with dear old dad. Dad enjoyed going to afternoon teas with his family, and he would always pick up the tab! In his later years, when he wasn't able to get around as easily, I would bring him some scones and cream from the our special events, and his replay was always, "I like scones!" Carolynn, Marjorie, Nancy, and Susanna love you and miss you. Jessica, Jacob, Zachery, Angelica, and Cedar, too! Oak Trees - Is it White or Red? There is a handy little trick to remembering the difference between a White Oak Tree or Red Oak -- The pointy leaves are Red Oak because the Native American's had arrows. The rounded leaves are White Oak because the white man had bullets. This fuzzy leaved plant is always a favorite of the children. Who wouldn't want to rub those leaves! It is a favorite of the fairies too I am sure, as it would make the most perfect blanket. The silver foliage on plants like this reflects the moonlight and gives a shimmer to the garden in the light of the moon. So in colonial time, this plant was said to be planted on the path to the outhouse. It would help to light the way and well, with those soft fuzzy leaves, I suppose they would come in handy if you were needing the outhouse! I have also heard that it was used as packing for wounds -- but I have never seen that printed in any historic documents so I do question that a bit. In any case it is a fun hardy perennial, that grows low to the ground and blooms a pretty purplish fuzzy flower. The flowers and leaves will dry for use in wreaths. We made a lamb's ear Christmas ornament on one of our bus trips to Herb 'n Ewe in Ohio years and years ago. 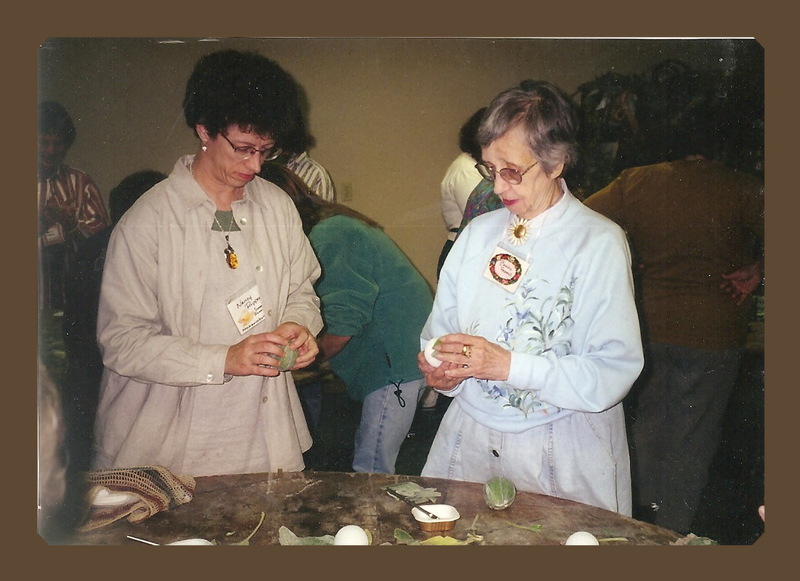 Nancy Reppert and Bertha Reppert crafting Lamb's Ears ornaments in October, 1998. Penn Cumberland Garden Club's recent standard flower show was entitled "Summertime" and reflected a wide range of summer activities: Weddings, Memorial Day, Fourth of July, Graduations and more. This class was a breakfast tray for Mother's Day. All of them were just so lovely. Wouldn't you just love to be served breakfast on any of these beautiful place settings? Susanna won her class which was a creative design class staged on a pedestal called "Graduation"
We celebrated the Queen's birthday a few weeks ago at our annual tea. 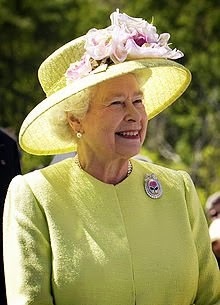 Although her birthday is in April, the official birthday celebration is always held in June. 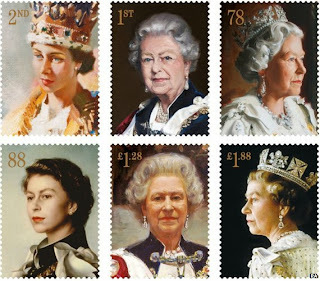 This year, the celebrations also included the 60th anniversary of her Coronation. We began by serving a Red Wine Slushy, deliciously sweet and refreshingly chilled! An appetizer of Marinated Shrimp Wrapped in a lightly steamed Snow pea Pod marked the first course. The Sandwich Plate included 1953 Coronation Mango Chicken Salad Triangles, Charles' Spicy Pecan Pimiento Cheese Sandwich, Royal Olive Pepper Pinwheels, Andrew's Spinach & Artichoke Crostini, and Buckingham Palace Rose Garden Sandwiches. Following the sandwiches, we served fresh from the oven scones that included Kensington Palace Scones (round) and Piccadilly Circus Orange Almond Scones (triangular) alongside Sweet Cream, Lemon Curd, and Orange Butter with a skewer of fresh fruit. Tempted by dessert, we had a Coconut Cream Bonbon, Earl Grey cupcake with mascarpone frosting, and Oh Baby, Banana Cream Tartlet. This collection of stamps that feature the Queen throughout the six decades of her reign was recently released in Great Britain. Long May She Reign!